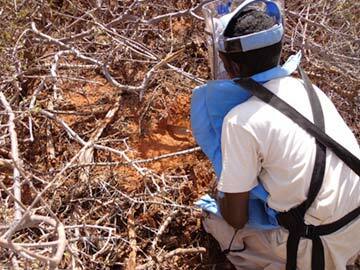 TDI has recruited, trained and deployed 4 x Manual Clearance Teams, 4 x Mine Risk Education teams and 4 x Explosive Ordinance Disposal teams into South Central Somalia by UNOPS. As the first commercial de-mining company to go into South Central Somalia and, specifically, Gedo Province, TDI was pleased to take up the challenge. The project is progressing well with the MCT and EOD teams completing their training in December, 2012, after which they immediately swung into operation. All teams have received certification and all other aspects of the project, such as logistics and personnel support, are in place. Operations have begun in Hiwan Province and Gedo Province, with the deployment of the EOD teams, MCT and MRE teams in Bellebweyne (Hiwan Province) and the same in Dollow (Gedo Province). The teams are making headway and recently located and destroyed a 250kg Russian FAB 250 HE FRAG Aircraft Bomb in Dollow, Gedo Province. Security continues to be an area of concern, with TDI operations being restricted in Dollow, Gedo Province, due to Al Shabab activities in the surrounding areas. However, the operational area has recently been increased from a radius of 10km to a radius of 30km from Dollow. The teams were visited by UNMAS dignitaries to Belledweyne on January 27 and Dollow on January 28 which resulted in positive feedback from all concerned. 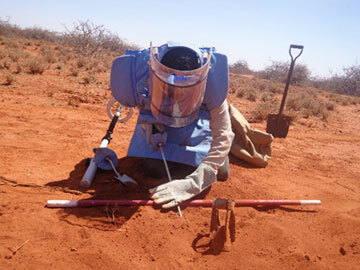 “Good progress was made in Gedo Province where the newly deployed MCT and EOD teams have been successful in locating numerous items of UXO, all of which have been dealt with,” says Steve Saffin, Operations Manager.